Tomorrow is the south-Indian festival of Karadaiyan Nonbu (or vratam in Sanskrit). 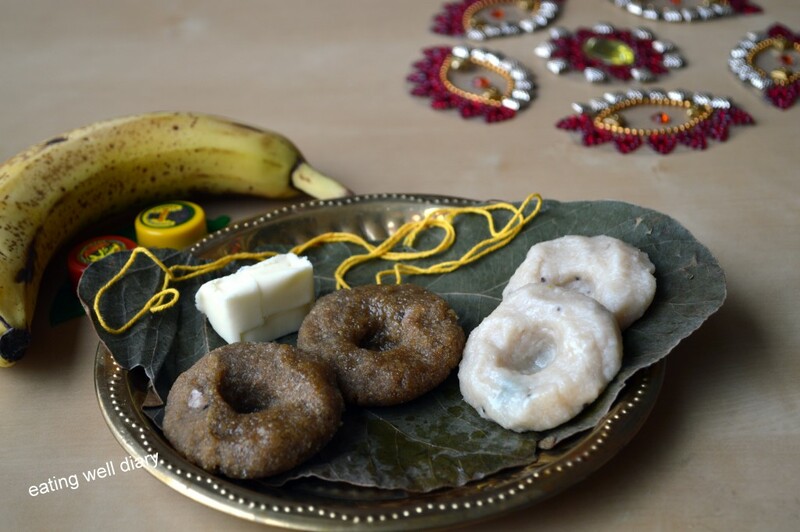 A traditional festival observed by many Indian families. The women pray for the health and longevity of their husband while younger girls pray for getting a good spouse. It used to be exciting to sit with our mother and other elder ladies in the house to chant a special prayer and eat this sweet with some butter after offering it to God. I remember as girls in school, we would discuss this with friends the following day and proudly display the little yellow thread (necklace) that we adorn during the nonbu! 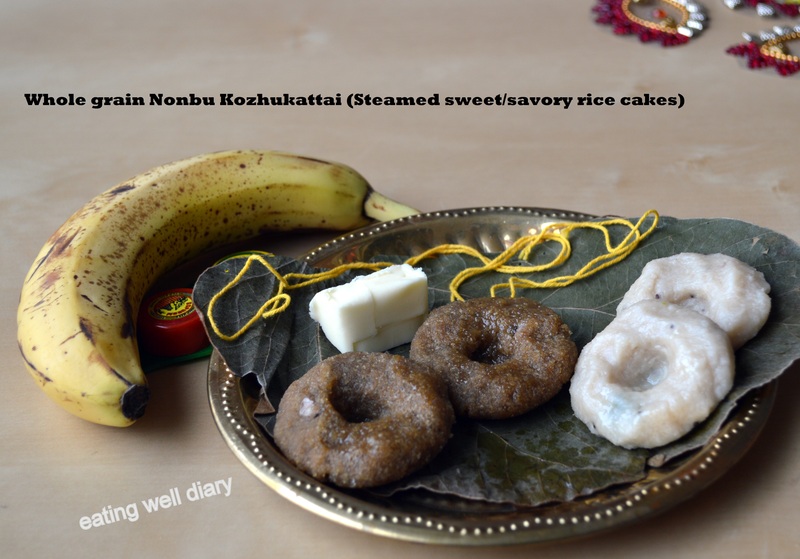 Traditionally this sweet called “nonbu adai or kozhukattai” is made with toasted rice and jaggery, with some black eyed beans and coconut that also add a nice crunch. Being a whole-grain fanatic that I am, I decided to try this with brown rice instead of white rice and did a test run yesterday. The result is good, approved by the husband to be blog-worthy! A savory version is also made. So here I am, hurriedly posting these recipes so that you could try it for the festival this weekend. 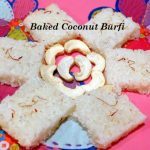 My blogger friends at the party Fiesta Friday #59 will have a taste of a traditional south-Indian festive sweet this week. Hope they enjoy it. Thanks, Angie, Jhuls and Mila for hosting the party! 1. Soak brown rice in water overnight or 6-8 hours. I used the brown sona masoori variety. 2. Strain through a strainer and air dry for a few minutes. 3. Toast in a pan on medium heat till it is completely dry and changes color. Set aside to cool. 4. Use a good blender or Indian “mixie” to powder it as fine as possible. Do this in small batches to get better texture. 5. Sieve to get powder of uniform particle size. 1. Soak beans in water for 2 hours. Cook the beans in a pressure cooker. Do not overcook. 2. 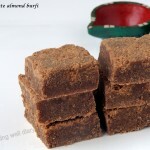 Heat jaggery in a pan with 1/2 cup water. When it dissolves completely, strain to remove any dust. 3. 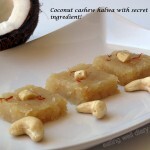 Return jaggery solution to pan and add toasted brown rice flour, cardamom, coconut and beans. 4. Stir on low heat to make a dough. Make a ball shaped dough and flatten into circles. Make a small dent in the middle. 5. Steam in a plate/ idli vessel till cooked, about 12 minutes. 6. This is usually served with a dollop of butter. Use Earth Balance for a vegan version. 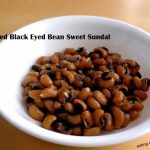 cooked black-eyed beans- 2 tbsp. 1. Heat oil in a pan and add mustard seeds, asafoetida. When the seeds sputter, add chillies, curry leaves and black-eyed beans. 2. Pour water and dissolve salt in it. 3. Add rice flours and stir to avoid lumps. Continue stirring till it thickens into dough. 4. Make the same shape as the sweet version and steam in a pot/ steamer. thank you, Anu. This is one of my favorite! Yes, Srividya, me too. I like savory better than sweet kozhukattai, in general. I am hearing a lot of this kozhukattai, never knew this earlier…Looks fabulous…I will try it sometime when possible!!! True, Malar. This can be an anytime snack! Beautiful click dear. As always traditional dish with ur healthy touch. Neatly explained. thank you, Vidya. Glad you like it! Wow! So traditional!!! Looks yummy tooo…. Yes, isn’t it fun, with different festive sweets! Happy FF, hope you had a nice weekend too. Lovely post, took me back home 🙂 Loved the whole grain version! Yes, Deepa. This is one of the few festivals that I cherish memories of. It’s very unusual sweets! I’m so glad you shared it with everybody at FF! Thank you, MIla. I hope you do enjoy them. Happy FF! Thanks for visiting, and welcome to this blog! The brown rice flour did add a nice flavor and texture to it. Happy Karadayan nonbu. 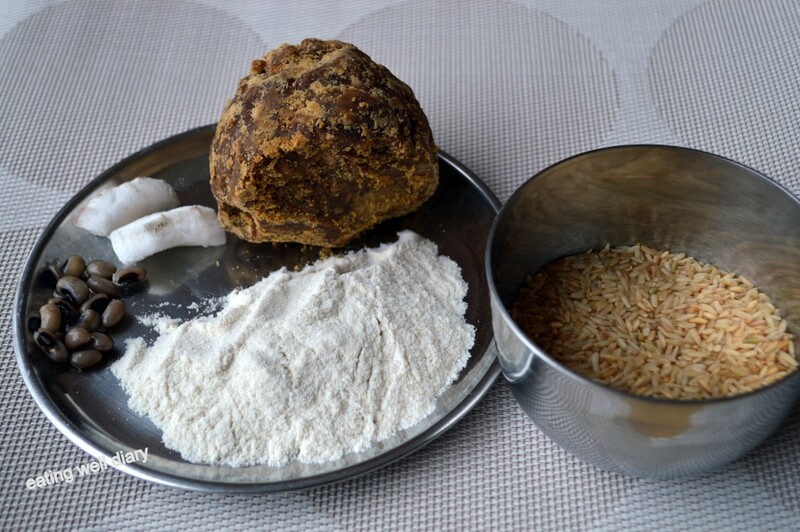 How do you make the “savoury kuzhakkattai” white, even though you make them in brown rice? Thank you, Appa. The brown rice flour looks mostly white and the savory adais are made with a blend with white rice flour. I love the idea that you have a festival devoted to good relationships. These rice cakes look festival worthy too! Yes, Julie, this is one of the few festivals that I actually enjoy because of the simplicity and the yummy cakes too! I really enjoyed learning about the festival, Apsara. How wonderful to have a special holiday to pray for your husband! These cakes look like they would add a lot of festivity to the holiday! Thank you for sharing about this special time. I’m so glad you enjoyed this, Shari. It is not a very well-known festival even in other parts of India, since we have different local cultures in the country. I do hope you try out these rice cakes. Two amazing tasty inviting yummy looking dishes, aka recipes! They both look magnificent too!